Week #24 – Victory is mine. Check this out – I know the focus on the actual subject totally stinks, but any guesses as to what these are? Hee! 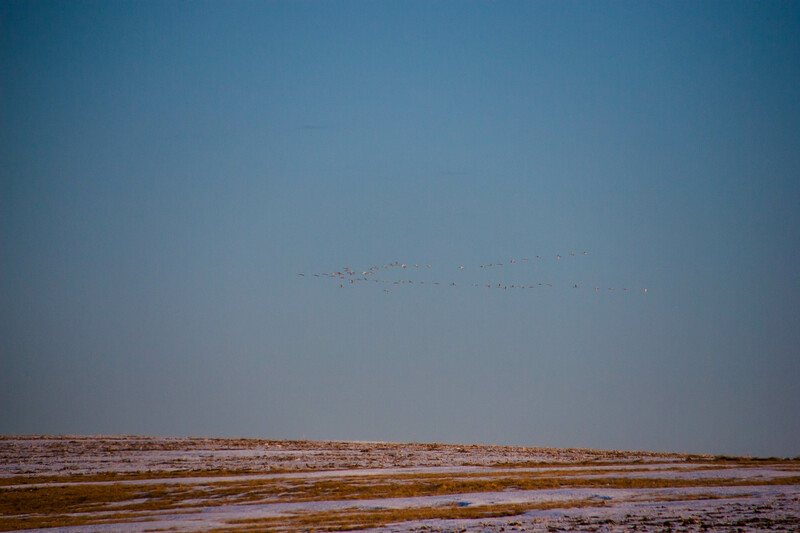 That’s an entire flock of Trumpeter Swans on their way to… wherever it is that they go! I kid you not, they flew right over the truck on my way home from the Bluff after taking pictures of the sunrise this morning! I’d seen them in pairs, but never in these massive numbers! And that brings to mind my greatest benefit from the MKMMA; everything I see is new. Everything I see is beautiful. The trail to the eastern overlook of the Bluff where I take my morning photos is 0.83 miles long, and on the way down today I found myself taking a deep breath – not to settle nerves or calm a negative emotion, but just to taste the scent of melting snow and old leaves, and fill my lungs with crisp, clear air and I said, “What a gorgeous morning.” And the thing is, it wasn’t the most vivid sunrise that I’ve seen so far… yet it was beautiful. I hate getting up early in the mornings – which should give a whole new dimension to the sunrise photo project – and yet on the two mornings I’ve not made the trip to the top of the bluff, I’ve missed it. Come the summer, I’m planning on just doing my sit up there after I take my pictures – the spot is perfect. So all that mental fussing back at the beginning, all that fretting over whether or not I would finish what I start this time, and day by day it’s suddenly done as if there was nothing unusual about its happening. And looking back… I don’t feel any different. I know better how to discipline my mind. I’ve been reminded of how I manifest the exact conditions in my life, so if I want time and financial abundance, I can create them. I’ve got the materials and I have my course set for my next six months… and the next… and the next. I now have a clear idea of where I’m going, and how I’m going to get there. And now there’s always something to take pleasure and rejoice in. There are miracles everywhere, however large or small. Still a lot of work ahead, mostly around going ahead and doing what I’m designed to do and now I can be of service when doing it. I’m forty-two (and a half) years old; it’s time to finally start LIVING! Taxes, taxes, icky icky taxes. Ordinarily I’d have them done long before now, but been putting off catching up on my business expense tracking, and now have to do that before I can calculate and file my taxes. There are times when I really, really want to do what my brother does – gather up all the papers and receipts and mileage logs and just hand them off to someone else. Make the numbers – and making sense out of them – somebody else’s problem. I used to actually like this time of year. There was a time – back when the numbers were my friends – when I’d have everything ready, everything kept up each month, taxes would take me less than a week after I’d gotten all the W-2s and 1098. There were years when we’d get our refunds back in mid-February. I’ve done no writing for the past four days and barely any photography except for my dawn project, because I’ve been focused, not on filing taxes, but preparing to file taxes. And I don’t like that. I all kinds of don’t like that. Told a fellow MKMMA member today, “This is soooo not ever happening again.” Once caught up, I am taking steps to stay caught up… proving once again that succeeding really is less work than failing. On the flip side of the equation, I’m getting more and more focused on what it is I really do want, which parts of my life are no more than annoyances or distractions. I attended the meeting of a writing group today and each person had to stand and talk about themselves and current projects for up to three minutes (which, as Leanne observed, explains why it was a three-hour meeting!) and among the first words out of my mouth when I stood were, “I love stories.” Whether it’s writing something true for my website or blog, or spending time in my own universe with my “imaginary” friends, those times are when all is right with the world. And I don’t do enough of it. I don’t do enough of it because even though it is my be-all and end-all, for some reason I prioritize it lower than things like housework, dishes, bookkeeping, laundry, learning and applying network marketing skills, and a multitude of other gnat-like tasks that I do simply because nobody else is going to do them. (And for the love of geese and little green apples, do NOT quote the OATS or the parable of the rocks, pebbles, sand and water at me!) My aim for this upcoming week is not to figure out why I prioritize it lower, ’cause that doesn’t matter. No, my focus is to rebuild the habit of doing more writing, Everything else will fall into place after that. So last week I called the temp agency – partly because in working from home, I was hardly ever in the world, the only person I really dealt with was my husband, and I felt like a cheat since I never really applied what we’d been learning under real world conditions. Would my happiness and optimism hold, if surrounded by negative people? Could I maintain my equanimity when interacting with the angry and bitter? If I never tested myself, how would I know? And I was torn, I truly was. I didn’t really want to go back to work in the regular world, I didn’t think it would be a good, productive use of my time, though I really did need to, to test what I’d learned at the very least. And I had agreed to the two shifts; in effect, I had given my word. But, oh, the lure of more pictures… some of which might work as stock photos and earn moola for us… and ice formations don’t last forever. So I called my mastermind partner, to help me hash it out. The question I asked her was this: Which would do me more damage in the long run, failing to fulfill a committment, or failing to take an action that would further my DMP? Her train of thought, bless her, very closely mirrored my own. In the end I decided to go with my first instinct and call the temp agency to tell them I would no longer be available for the shift that night, and meet Ivan between 2:45 and 3:00 with camera and tripod in hand. And there were no negative consequences from the temp agency; they understood completely and appreciated that I would still be in to work on Tuesday. Turns out the man who owns the place is a plumber, and hooked up pipes and hoses to the artesian wells that are so prevalent in southwest Wisconsin and southeast Minnesota. He does this every year, just letting the water run, so that wind, water, and winter weather create enormous towers and ripples and tunnels for people to enjoy, as a memorial to Nick Bayer, a local fellow who died in an accident in 2009. I don’t know the whole story yet, but I will soon, and then the story will go up on my website for other people to find and enjoy. I can’t wait for next year, when I can go out to watch the sculptures forming, and to see them lit up at night! And if you were wondering, the shift on Tuesday went really well. I’d forgotten how fun line work can be – the sheer physical nature of it, playing the game of how-well-can-I-do, how-fast-can-I-go, getting to know new people. I couldn’t use my left hand at all the next day and my sleep schedule got all messed up and I needed to take sunset pictures on Wednesday instead of sunrise because after getting home at three in the morning and soaking in a hot bath to try to soothe aching muscles and then deciding to take a quick nap before heading out the to bluff I could not force myself to get up two hours later and hike up that hill… and even if it wasn’t a good use of my time, I wouldn’t trade the experience. I found out what I needed to know, I laid some old ghosts to rest, I am a better person for the experience… which I guess makes it a good use of time after all. And apparently I impressed them at the packaging plant; the temp agency called the next day and said they needed people that night and had asked for me specifically. And in taking the sunset pictures, I met more people up on the bluff – including three young highschooler-age kids who were up there for pretty much the same reason. I offered to take their picture with the one girl’s phone so that all three of them could be in the photo with the fiery sunset in the background; they were pleased and grateful, and who knows? Maybe that was part of the reason I ended up being up there at sunset instead of sunrise on Wednesday. This week, I went to write my blog post only to find I literally have nothing to say. It’s forgivable; it does sound ludicrous, but I’m really not kidding. I have run out of insights, wisdom, questions and energy. I suspect that lack of sleep has something to do with my mental state being in neutral. I started a new photography project on the first of March; taking pictures of every sunrise for a year, from the top of Barn Bluff (a local geographical point in Red Wing). I’ve tried changing my mind, influencing my thoughts, deciding differently, and I’ve come to the conclusion that while mornings and I can get along when we have to, we will never be fond fellows. I’m one of nature’s night owls, and I am perfectly happy that way. Why then am I taking sunrise photos, particularly from a place 1001 feet above sea level that takes forty minutes just to walk/climb to? Because I’ve never done it before. Because I like taking pictures, and sunrises are great subjects. Because it’s going to be difficult to do for an entire year, especially once the days get longer and longer and the sun starts rising at 5:30 AM – which will mean I’ll have to get up at four to be there on time – and even more difficult in the waning part of the year when the temperature drops, since if there’s anything I dislike more than getting up in the early morning it’s being cold. Because it’s quiet up there, and there’s a kind of magic in watching a town wake up. Because stellar mechanics are fascinating, and I’m looking forward to watching the sun migrate back and forth on the horizon over the year. Because I hadn’t been doing much with my camera recently and I’d missed it. Because I’ve been feeling more like a fraud with every week that passes and I’m not out among people to put these new techniques to the test, and not yet manifesting abundance in my personal or professional life – at least, not that I can see. And I’ve had trouble with schooling my thoughts despite the Master Keys and Og’s Scroll IV… which is probably no more than my old blueprint and peptide addiction for feelings of low self-worth talking (thank heavens). It’s unfair of us to expect of ourselves to be great at everything we ever wanted to do, even though we can be great at anything. I love to write. I love to take pictures. Reckon that’s enough. I don’t need to be a race horse, polo pony and jumper all in one. Time for me to hit the rack; the sunrise waits for no one. I’d had a blog post all prepared, but was hanging onto it for some reason instead of publishing – didn’t know why. Then Jerry and I were out running errands and stopped at the local Chinese buffet for lunch. Jerry likes Chinese. I can take it (no pun intended) or leave it. The food tastes good, but there are a lot of dishes that have onions (which I’m allergic to) so my selection is usually pretty limited. S’okay, though; I’m rather fond of sweet and sour chicken. This place in town is a nice one; small, friendly atmosphere, cheerful waitstaff no matter who’s on duty. Today there were some folks chatting when we arrived. It was pretty obvious that these two groups had only just met; they were talking about “getting to know you” stuff – profession, families, where they live, the price of farmland, that sort of thing. Now, I’m generally very… courteous, I suppose would be the word. If people are having a conversation in a restaurant, I assume their words are not for all and sundry and I turn a deaf ear. Granted, a restaurant is a public place, and granted that for some folks their normal speaking volume really carries. But that’s no reason to listen, and doubly no reason to remember what I hear. This older gentleman, though, was talking about his kids – he has three, one of whom is a Master Sergeant in the Air Force permanently assigned to the National Guard Armory in Hastings. The talk moved on to retirement and finances, and he said something to the effect of “We’ll never be rich, but we’re not poor, and we can do some of the things we always wanted to do.” And I found myself wishing there were something I could do, some way to have a conversation where I could bring the talk around to offering him… something, anything, to change that accursed resigned acceptance of less than. The five of them were engaging in a Minnesota goodbye; saying farewell, mentioning they had to go, then starting a new conversation. I might have mentioned a time or two that I come from a family with strong military ties. Among other things, that facet of my life grants an almost automatic kinship with other military family members. I wasn’t thinking of my Franklin Makeover virtue for the week – courage – or about that half-formed thought I’d sent into the universe, or even about the conundrum that revolves around the Law of Giving, the Law of Compensation and the principles in the Strangest Secret – specifically, “give more get more” yet we are to give without expectation of reciprocity even though just being conscious of the dynamic involved means we can expect to be given to as we give. It’s a puzzle in logic that I play with (and yes, I do actually know what the answer is, it’s just more fun to toy with the question). So I got out of my seat and went to tell him, “Thank you,” for his part in raising a Master Sergeant as he was waiting for his folks to finish their farewells. He said he hadn’t done much, and mentioned he also had a daughter in the service (a Captain in the Air Force), and I mentioned my brother who was an E-6 before he was honorably discharged, and we got to chatting. Well, we both laughed about that, but turns out he has a brilliant idea for a niche website. See, retired military and the immediate families of active duty members can rent rooms on bases around the country, rooms that would ordinarily go empty. It’s a win-win; families and retirees get basically hotel service in a secure area, and the base gets the funds for what would have been wasted space. Prices have gone up over the years – used to be $20 a night, Steve was telling me – but now it’s comparable to or maybe a bit more expensive than a Motel Six. Well, some years back he and a friend thought that it would be nice to have one place where a person could go for information on the base housing – prices, locations, and the quality of the place. Because apparently bases vary wildly in those categories; some, he says, are finer than 5-star hotels; others are real dives; and still others are clean and amenable but constructed along institutional lines – ‘institutional’ as in a mental hospital. But he’d convinced himself that nobody would be interested knowing things like that, and honestly where would you publish those kind of articles anyway? So the idea remained dormant. And I said, “I would be more than happy to help you out with that.” Because writing, after all, is what I do. And while I resent ‘being of service,’ I LOVE ‘doing favors.’ And I have some small experience with passive-income niche websites – which I suspect Steve doesn’t know anything about. And there’s no denying that knowing what style and quality of base housing is available would be valuable to military families who want to visit loved ones, or just take advantage of some of the travel perks. And I can think of so much that could be added to the reviews of the bases! What’s nearby, for example, both for dining and activities. The best travel routes – not everyone has a GPS. Base events that visiting families could attend. I mean, seriously, I’ve already started to organize the website in my head. And once the website has a solid followership, gift that passive income stream to him so that his own travel and experience then become self-sustaining. Ah, but three hundred words plus that actually mean something – that’s something else. Decisiveness is my word this week. I was a little concerned when Mark said during the intro video last webinar that each week we should be finding more examples of our word than we had of the word the week before… there were so many examples of kindness in week two of the Franklin Makeover that I lost track of my count! And I was in the world outside my home more, which helps. This week, I’ve kept going back to the beginning of the MKMMA, reminding myself that indecisiveness is the worst kind of controlling personality – even when the indecision is directed at yourself. And that in turn reminded me of a conversation I had with my Dad a few years back. So I was trying to explain to my Dad why it was I kept an open mind on virtually all subjects, and he was trying to explain to me why I was wrong to do so. One of the things I said in an attempt to illustrate my point was that Truth is actually too all-encompassing for our minds to hold in its entirety; we can only catch little flashes of that greater whole, usually through intuition. So the little truths that we believe to be immutable and complete are really nothing of the kind; those truths can be changed with a shift in perspective, with more experience, with better information. And if it can be changed, how can it be said to be TRUTH? The rest of the conversation didn’t go well. Partly because in my Dad’s mind I was wrong before I even opened my mouth, but I reckon the bulk of my failure to convey what I meant was rooted in the fact that I was trying to use clumsy words to give voice to my assertions, those tidbits of knowledge and intuition that struck right to the core of me, picking me up and shaking my soul like a dog with a rag bone. How can you explain TRUTH with mere symbols?